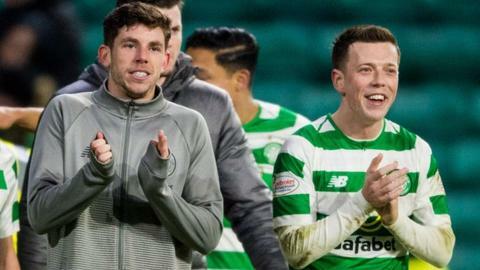 Callum McGregor and Ryan Christie are likely to miss Celtic's next two games. McGregor, 25, was absent with a calf problem as Celtic beat Motherwell 4-1 on Sunday - a match in which Christie, 24, went off with a hamstring strain. Leaders Celtic visit Hearts in the Scottish Premiership on Wednesday and take on Hibernian in Saturday's Scottish Cup quarter-final. The players could also be doubts for Scotland's matches next month in Kazakhstan and San Marino. "He'll miss probably the next game or two then we'll take it from there," Celtic assistant manager John Kennedy said of McGregor. "Same as Ryan Christie. Again, we'll see how he progresses."